Mouser was very surprised today. First real snow of the season, and Kiteh stayed out for at least 10 whole minutes and spent the rest of the morning safely and snugly tucked behind the woodstove. 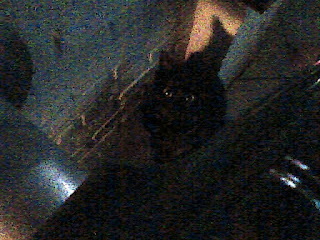 I took a snap, the quality isn't that good, but you can see Velvet Claws™ there not planning to go anywhere soon.